Leslie here from Tour America in Cork and I’m just back from a wet and wild adventure at one of the most amazing places on earth, Seaworld Orlando. I know a lot of people have already been to Orlando and probably very familiar with the Seaworld parks but for those of you that are not familiar you may find this helpful. We flew British Airways Club class and of course this was amazing. The food andservice onboard was excellent. The seats do completely turn into aflat bed and I can definitely say it was the most comfortable flight Iever took! We flew into Tampa airport and were queing for only15 minutes to clear immigration. We then got a transfer to our hotel TheWestin Harbour hotel and as the name suggests it was over looking theharbour. This hotel did have a business feel to it. The room here wasvery spacious and really lovely. The room had a huge king bed and flatscreen tv. The bathroom was also very spacious. On our first morning (Thursday) we took a very quick tour around Tampa. The cruise port is so accessible and only minutes from downtown area. We went to Ebor city which is an historic area just northeast of downtown and if you have clients staying in Tampa definitely recommend that they go here for lunch or few drinks and evening meal. It dates back to the 1800’s where it was populated by cigar manufacturers and thousands of immigrants mainly from Spain, Italy and Cuba. After our city tour we went to Busch Gardens which was aprox 10 minutes from downtown. Busch Gardens has the most roller coasters of all the Orlando parks. You would easily spend a full day here it’s huge. We did a very short safari for 10 minutes but it was fab. A must for everyone to do here is go to see the Iceploration show. Access to the theatre is included in your ticket. We went in the afternoon and it was a prefect time as we all needed a little break from the 95degree heat. The show is on for about 30mins. It can get a little chilly in here as during the show they have snow falling on the audience. The show itself was amazing. Its all on ice and it takes you on a trip around the world to the Serengeti, the Great Barrier Reef, The Artic and the Amazon. The costumes, lighting and skating are truly fantastic. There are other shows here as well but we didn’t have time for them. I’d recommend looking at their website and looking up the different ones. From Busch gardens we got a transfer to Orlando. This only took about 70 minutes. It is a great option to fly into Tampa if you want to do sometime in Clearwater/St Petes (only 25 minutes away) and do Busch Gardens before going to Orlando. But of course Busch is really accessible from I-Drive with transfers going from Seaworld. We stayed at the Doubletree by Hilton at Seaworld. The location was ideal for the parks we were visiting, only 5 minutes to Seaworld, Aquatica and Discovery Cove. The hotel was beautiful starting with the lobby. It’s got a lovely tropical feel to it as soon as you come in. Our rooms were in the resort and not the tower so therefore when going to your room its like a motel where the rooms are outside. The room itself was fab. Mine had 2 queen beds, flat screen tv, safe, microwave and full sized fridge and it was interconnecting so you can request this for families, quite typical of a lot of American hotel accommodation really. The bathroom was small with the sink in the room itself. There are wooden shutters that can divide the sink area from the rest of the room. There is a Walmart about 6/7 mins away where you could stock up with food seeing as the fridge is full size! Theres also a shop onsite. The grounds of the hotel are lovely. There’s 3 pools but you do need to take a walk around the premises when you get there otherwise its easy to think that there’s only one pool. At the main pool area they have a bar. Also the pool was open until midnight so if you’ve been at the parks for the day its great to come back to the hotel to chill out at the pool for a few hours. Breakfast at the hotel was a buffet and there was loads of choice. We had dinner in the hotel on our first night and the food was beautiful. On Friday we went to Seaworld. The first thing we did when we got here was to go and see Turtle Trek and all I can say about this is “Amazing, Amazing, Amazing”. This is a 3D show in a 360 degree Dome and follows the life of a SeaTurtle. You really get to experience what it is like for the Turtle’s and the everyday dangers and experiences they encounter. When you enter the Dome, you get 3d glasses and and become “Nyah” a baby sea turtle. I’ve looked at you tube videos of it and really nothing will do this justice. You have to experience it for yourself. You really feel like you are actually in the ocean yourself and find that you’re ducking and diving.. The whole experience is surrounding you, it’s not just on a screen, you’ll find yourself looking up, looking around. At one stage I thought a huge jelly fish was going to land on my head and grabbed onto the girl next to me! After turtle trek we went and fed the stingray and sea lions which was $5. We also fed kangaroos, also $5 and dolphins which was $7. The main rollercoasters here were Kraken and Manta. We went to see the Blue Horizons show which was fantastic, it features dolphins, tropical birds and acrobats and it’s about 30 minutes. We also saw One Ocean, Shamu Show featuring Killer Whales. This is also 30 minutes and it’s a great way to take a break from walking around the park. We had dinner at Sharks restaurant in Seaworld and it was gorgeous. It’s a really cool place cause you’re watching sharks swimming around while you’re eating! On Saturday we went to Aquatica. It was so busy here that they reached full capacity and had to close the park around lunchtime and not allow anyone else in. I’d recommend that people get there early if they want to get an umbrella at the beach area. There is a limited number of them but it really does help especially in the early afternoon when the sun is scorching. But of course there is so much to do here if you get too hot in the sun. The lazy river was my favourite and could have spent the whole day in there. We had lunch at the buffet restaurant and they had a mix of everything there. The only thing was we went at 12.30 and the que was unbelievably long and there was no sign of it moving so we left and came back at about 2.30. There was still a que at this stage but not as bad. After Aquatica we went to the Florida Mall which took us about 15 minutes to get to. This mall is huge and had Macy’s, Saks, Bebe, Foot Locker, Adidas, Nine West, Aldo and so much more, it’s a shoppers paradise! Saturday night we went to Bumba Gumps in City Walk. This was a very cool, chilled out place and the food was fab. I would definitely recommend it to everyone, couples, families, for one night. On Sunday we went to Discovery Cove. This was so relaxed compared to the parks that we had been to. We arrived there at 8.30am. You have to check in when you get there and they give you your swim time. The park opens at 8am but they do start checking in from 7.30am. I would recommend clients get there early because you cannot pre-book your swim time so it could be anytime from early morning up until about 4ish. We had breakfast and lunch there and both were buffet. There is a lot of choice and the food was really nice. It’s all inclusive here so you can get drinks, snacks throughout the day. You do have to present your photo id when you are checking in and they give you an id for the park that has your date of birth on it and this is what you use when getting alcohol. The park is gorgeous, it’s like a caribbean island with white sand. You can just chill out here for the day and go see the Fresh Water Oasis which has a rainforest canopy and clear springs or you could visit the aviary or take a underwater walking tour with Seaventure or go snorkeling. The main attraction here though is of course swimming with the Dolphins. They divide you into groups of 5 and show you a video and talk to you about what you can and cant do before you get in the water. Once you are in the water, there are 2 trainers with your group. 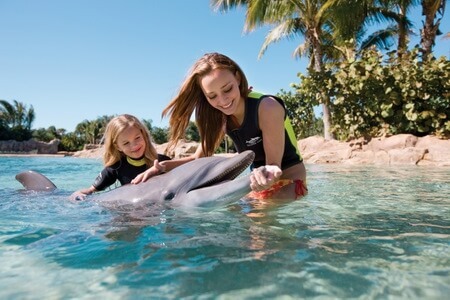 You get the chance to feed the dolphin and learn about them from the trainers and of course swim with them. This is an amazing experience. They capture your experience on camera and you can buy photos of the whole experience afterwards. I got one photo and it was $25. One thing to be aware of is that the water is cold here so you can wear a wetsuit which I did and the water was perfect. Also you have the option of swimming with the dolphin in shallow or deep water so if you can’t swim or are nervous about deep water, you will be fine in the shallow part.